From the existing geographical condition/topography, the design integrates the language of existing landscape and transform it into open/ semi-open public space. 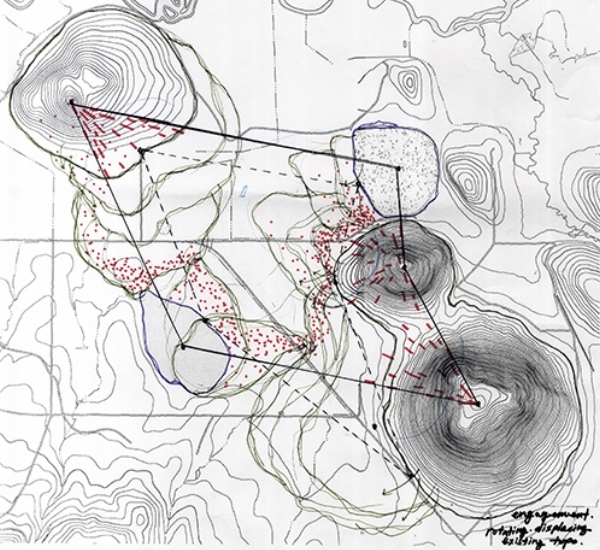 The geometry of the site is generated by reflecting surrounding 3 other buttes’ and itself’s topography on the surface. By adding and subtracting the forms of ground from the site, the butte, the quality of the language of the site gets amplified which allows people to experience the nature to the greatest. The programs (performance stage, music institute, residential) are brought together through the method of the ground formation. The system of penetrating transversal corridors for pedestrians and roads operates on different levels throughout the exterior and interior of the site and the building. The pathways become the links between the natural landscape and the built environment. The gradual experience of ramps from the ground level to below ground and back on the ground level offers diversity in the experience of the nature. From one strip of pathway, people can feel both extreme openness and containment. The language of slots of strips continues to the design of the building, used as private practice rooms, circulation paths, windows, voids on the ceiling for natural lights, and more. The top view of the design which is covered with earth and grass blends into the nature while the elevations and the sections of the design highly contrasts with the surroundings by using transparent and light materials like glass and thin columns for structure. The juxtaposition of two qualities diversifies the experience of the site. Hand sketch representing concept of carving of underground space with reflection of existing topography above ground. Hand sketch 1: Intervention, penetration, and bridging of views. Hand sketch 2: Engagement, common view sheds. 3. parking lot/entrance (connected to the concert hall, capacity of 1,000 people). 2. different experiences of music/common view sheds, creation of new boundary.